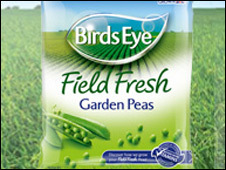 Frozen food group Birds Eye has cancelled the contracts of nearly half its UK pea growers due to the withdrawal of an Italian export deal. Birds Eye said 180 farmers across Norfolk and Suffolk would be affected, and that it made the announcement with "great regret". It is estimated that the loss of the deal will cost growers an estimated £5.5m in lost income. Numerous people are also set to lose their jobs as a result. Anne Murphy, managing director of Birds Eye, told the BBC's Farming Today programme that the company will be in "dialogue" with the affected farmers "over the coming weeks around what [the] next steps are". Murphy highlighted that "a very strong working relationship" continues elsewhere in the UK. The company's 230 pea growers across Yorkshire, Lincolnshire and Perthshire will not be affected. Birds Eye, which is owned by private equity group Permira, said the Italian contract had been cancelled at short notice and that they became aware of the situation late in December. The frozen food company said it had looked into alternatives but said the cancellation of contracts had been the "right decision for the business". Some of the affected farms in Norfolk and Suffolk have been supplying the firm for 65 years since the UK's first frozen peas were produced in Great Yarmouth. "Growers got a bombshell", said Michael Pollitt, agricultural editor of the Eastern Daily Press. He suggested that farmers may now have to turn their hand to other crops such as barley production, as a viable, but less profitable source of income. He said the pea-growing industry was a profitable business that offered several environmental benefits, including adding nitrogen to the soil and benefiting wildlife.